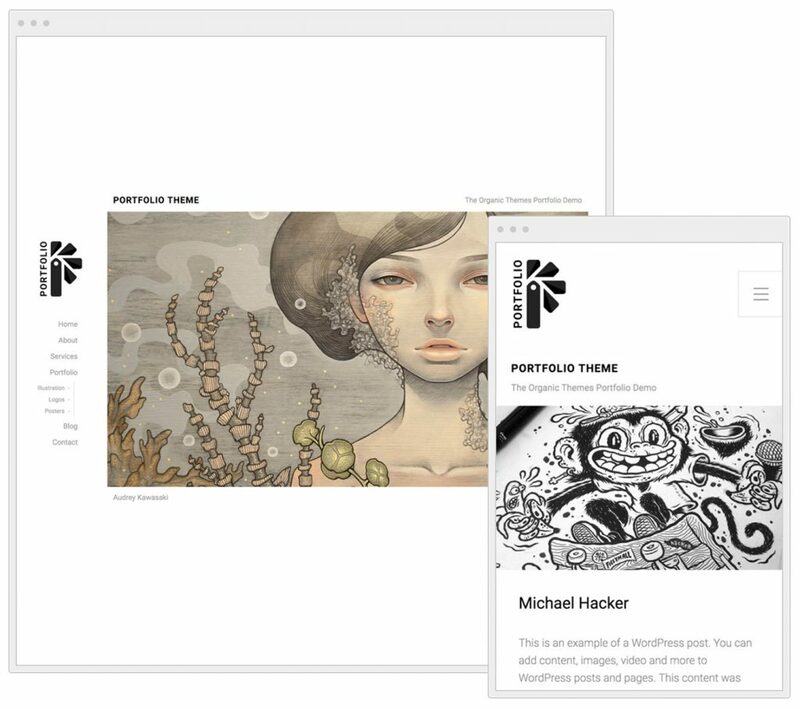 The Portfolio Theme v6 — The Best WordPress Theme For Artists and Designers, Again! 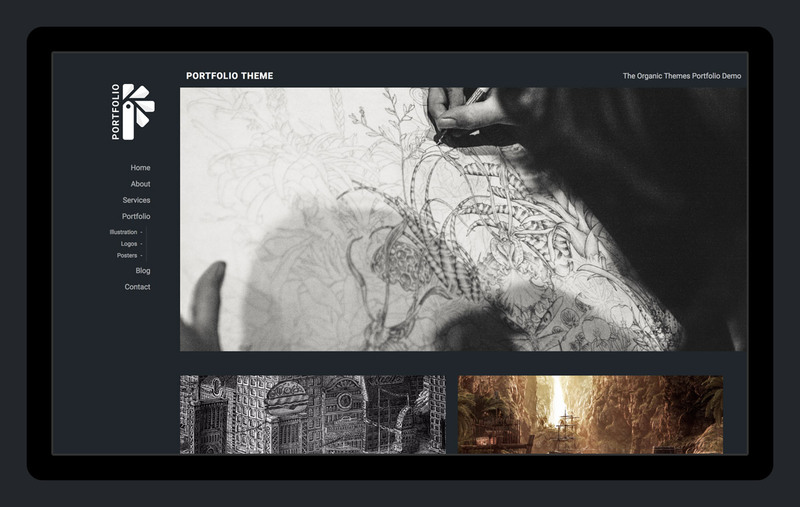 The Portfolio Theme has received another overhaul. It’s the sixth major update to our popular theme for artists. We have re-designed and re-developed it from scratch. As a result, the Portfolio Theme is better than ever! It features a more dynamic and responsive layout, and an easier setup process! As a designer and illustrator, I created the original version of the Portfolio Theme to be used as a personal portfolio for my design and illustration work. Our most popular themes have developed from the desire to fill a personal need, and the latest version of the Portfolio Theme is no different. My personal site was in need of a facelift. So the Portfolio Theme was once again re-built to suit the needs of my personal portfolio and blog. The new Portfolio Theme is ridiculously easy to use. Portfolio pages are created using categories, and the theme includes page templates for displaying various slideshows. Slideshows are centered vertically and horizontally within the browser window. So your work is always the center of attention. In addition, the theme is compatible with the portfolio custom post type available with the Jetpack plugin. As a result, using Jetpack plugin provides an additional way of adding projects to your site. As with all Organic Themes, options are managed within the native WordPress customizer. There are no bulky and confusing control panels. Just open the customizer to watch your changes take place in real-time! Color options abound within the new Portfolio Theme! As with our recently updated Structure Theme, when changing the background color to a darker color — content automatically adjusts to a lighter color. So no matter what color you choose, your content will always be visible! Content is always visible, even on dark background colors! Overall, Version 6 of the Portfolio Theme is a simple, minimal and dynamic website solution for anyone in the creative industry. Give your talent the professional presentation it deserves with the latest version of the Portfolio Theme! Note: This is a major theme update! If you are updating to Version 6 from Version 5 of the theme, the design of your site will be completely different. In addition, you may need to reset options within the WordPress customizer. If you unknowingly updated to this version, and need to revert back to the previous version, please contact us for assistance. Wow, the theme looks really good. Wow, it’s so great that you guys continue to challenge yourself and raise the bar. This looks like a major upgrade for the portfolio theme. I will try to use this on my next website. This is a greate theme for professional. It’s cool.